Dried beans, rice and flour were all over our living room floor. 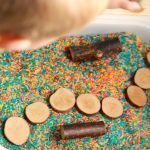 So what are those benefits of sensory bins? What’s all the fuss about? How can sensory bins help your child have a healthier sensory system? 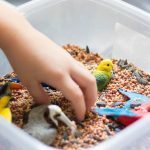 Sensory bins are a fun, non-threatening ways to introduce a child to something they typically avoid (sand? water? certain fabrics?). Many kids have aversions to certain textures. But a sensory bin can help them forget their fear. They are just so inviting, many kids can overcome their initial hesitancy and enjoy a new experience. Maybe your child is a seeker. Maybe they LOVE the feel of water, or silky scarves. Sensory bins can be an excellent socially acceptable way to give your child the sensory input they are craving! All you need is a “base” material (water, rice, beans, cotton balls) and some manipulatives to add like spoons, toy cars, or little figurines. You can use more than hands! 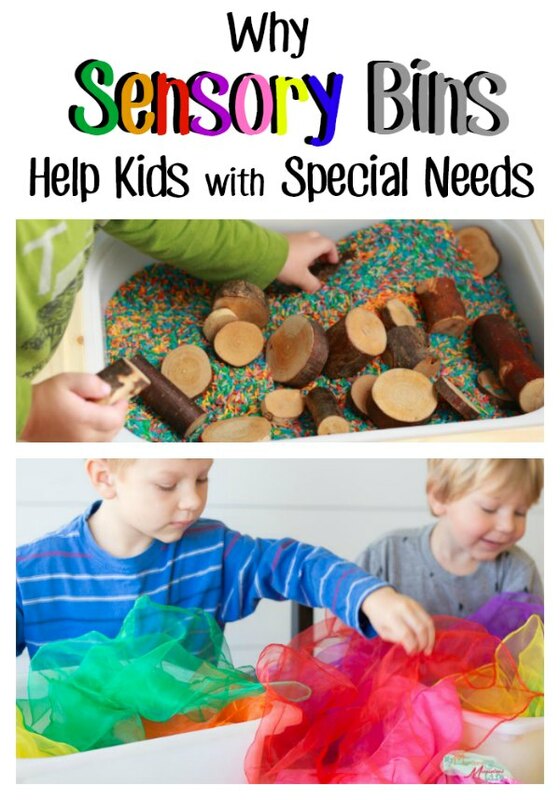 The whole body can get involved with sensory bins! 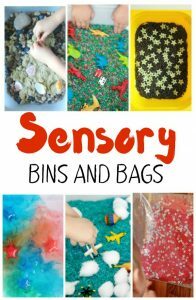 Think about a ball pit or a swimming pool as giant sensory bins! But even if you’re still using the typical small bin, you could invite your child to place their feet in sand or crunch dry leaves. See if they’d like to touch a feather to their cheek or run an ice cube on their leg. But ALWAYS follow their lead and never force anything. The key to the success of a sensory bin is FUN! Don’t worry, it’s ok if your sensory bin looks “boring”. You’re not trying to go viral on Pinterest or get more followers on Instagram! You’d be shocked how long kids can be entertained by some dry rice and a couple cups and scoops! If you child isn’t a fan, try something else, but a couple days later, circle back to the first sensory bin. Sometimes kids don’t “dig in” until they’re presented with the same bin seven times! Don’t get hurt feelings and don’t put any pressure on your child. Remember, FUN! 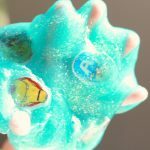 Want help getting started? 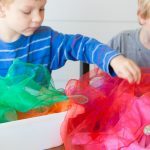 My friend Susie is the queen of sensory bins (and being hilariously down-to-earth) and she show you how to set up your very first sensory bin! Need some ideas for bins that you can do TODAY??? 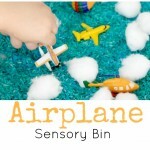 Here’s a bunch of sensory bins I’ve personally done with my kids that were a HUGE hit! (Don’t have time to look at the massive sensory bin list just right now??? Save it to Pinterest (HERE) so you can peruse it when you have five minutes!